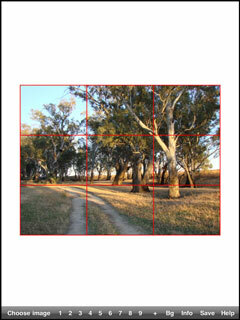 Draw temporary grids on images, with up to 9 sections each way. Change the background and hide the button bar. Enlarge part of an image with a single tap. Zoom out on an image by pinching. View small images at fullscreen. Temporarily transform all the image values into black, white and middle gray. Save images with or without grids to the Camera Roll (Saved Photos) album. Show the pixel size and height/width ratio of any image. Paste an image from the clipboard, adding it to the Camera Roll album automatically. Swipe left or right to view other images in the Camera Roll album. Display images in portrait or landscape mode. When you are sketching or painting it helps to put dots on your paper corresponding to the grid intersections. The dots can be done by eye and need only be approximate. Click here for information about the computer versions of GridaPic. There is also an iPhone/iTouch version called GridaPic Little. Click here for more iPad and iPhone/iTouch apps by DARE Software.